Buy 5 or more for $2.00 each! This will help ensure you have a male & female plant to produce the showy fruits. American bittersweet is prized in the landscape for its showy fruit clusters. It is a twining vine that will appreciate a sturdy trellis. The fruits begin to appear in July and often last well into the winter. Male and female flowers appear on separate plants. They are yellow and fairly small. The female plants will have fruits if there is a male plant nearby for pollination. This plant attracts a wide range of wildflife. It's a host plant for at least one species of moth. Bees and other insects are attracted to American bittersweet for nectar and pollen. Rabbits and squirrels will also use the plant. Bluebirds, quail, and several other birds eat the seeds. They are inedible for people. Q: It says buy 5 American Bittersweet to ensure male/female combination. Is there a way to ensure that with buying only 2-3 plants? A: At this point, no. Our plants are about a year old, grown from seed. We can't determine male/female until we've seen them bloom. There is a slim chance that a few of them will bloom this year in May or June, but that is unlikely. Q: Is the picture of the berries displayed here taken by you in your nursery, or did you find it online? I am asking because sources that i had bought bittersweet from showed american, but sent me oriental. A: This is our picture. All of the photos on our website are ours; we don't pirate images from the internet. Q: Are you certain that you are selling American bittersweet? With the flowers developing at the end of the stem and not along? A: We are certain. The flowers are in terminal clusters, the fruits have orange valves. Oriental bittersweet (C. orbiculatus) has axillary flower clusters and yellow valves on the fruits. We grow our plants from seed we harvest and would find it difficult to mistake the two species with each other; the fruits are noticeably different. Q: I've had 2 vines growing for the past few years ( bought 2 at a local sale in St Louis) and they have never produced fruit. Is it safe to assume that I have only female plants? They bloom with the small yellow flowers, but that's it. If I bought more plants, how could I identify a male plant to ensure fruit development? Q: What does this look like in the spring and summer? A: In the wild, it isn't especially noticeable during spring and summer. It is a vine with light green, alternate leaves. 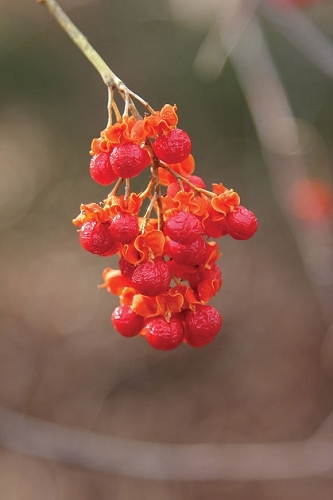 In late summer/early fall, the berries begin to form in spherical, pale orange pods.